Our most well trodden route into and out of France takes us round the cathedral city of Chartres. The surrounding countryside is quite flat with big skies, huge fields and little or no hedgerows. It’s pretty darn dull on the whole. Other than farmers monotonously tilling their soil with tractors dwarfed by the scale of the landscape, very little stands out. Very little, that is, other than Chartres’ Cathédrale Notre Dame. It can be seen towering above the countryside and dominating the skyline from miles around. 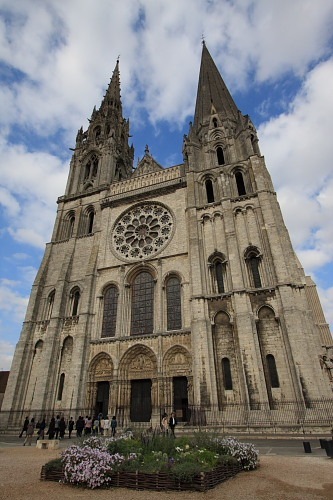 Since the town is reportedly “unremarkable” (according to The Rough Guide to France), we have always stared at this enormous edifice, merely for something to look at, as we approached Chartres, prior to hitting Chartres’ busy ring-road and driving on to our destination. Not this time. 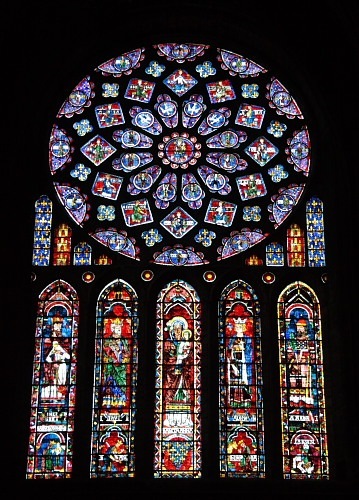 Since we had chosen a more leisurely pace travelling northward in three days instead of our more usual two, after our 200mls/320kms journey from near Limoges we stopped at Chartres to take a look. Conveniently, there is a municipal campsite in town offering a leisurely 3kms/2mls stroll along the river Eure into the town centre. We pitched up around 2:30 PM and took a leisurely stroll along the river Eure. The town seemed rather better than advertized to me. We found a particularly fine-looking cheese shop. 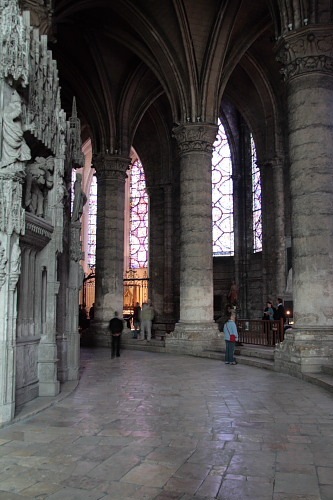 The cathedral is, and I quote (The Rough Guide to France), “… one of the finest examples of Gothic architecture in Europe”. It was built between 1194 and 1260, which was apparently very quick. It’s most intriguing feature has to be its original 13th century labyrinth described on the floor of the knave. The labyrinth is a 260 metre long convoluted path encapsulated within a 13 metre diameter circle. 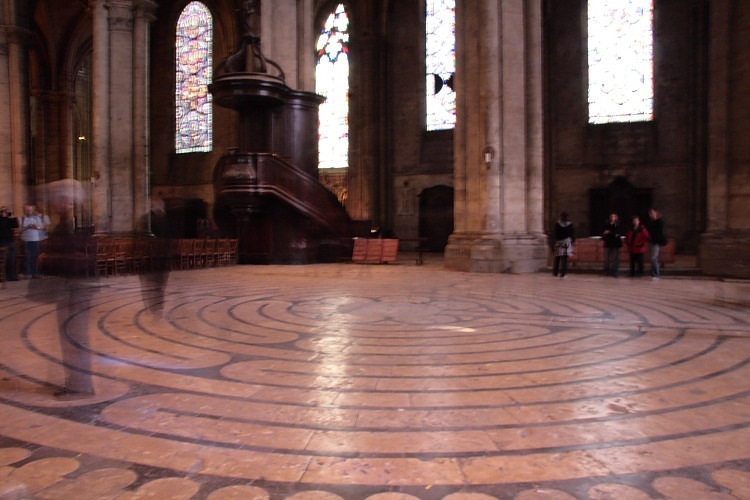 Apparently other cathedrals used to have labyrinths but they were mostly ripped out when the authorities [Ed: presumably religious authorities] saw them as frivolous. Most visitors naturally feel compelled to walk it. Carol did, I didn’t, since you ask. I’m glad I’ve seen the cathedral but, other than the labyrinth, I found it unscintillating. It’s very dark inside and dimly illuminated. We really needed a tripod which was a leisurely 3kms/2mls stroll along the river Eure back in our car. Duh! Carol found the cathedral much more fascinating than I and consequently took some good representative shots bracing her camera against any solid support she could find. Bravo! The time exposure of the labyrinth with ghostly images of people walking it work well, I think. My brain was off.